Smart Water is an essential component of the smart environment since life, sustenance, growth and death of the environment depends on water. 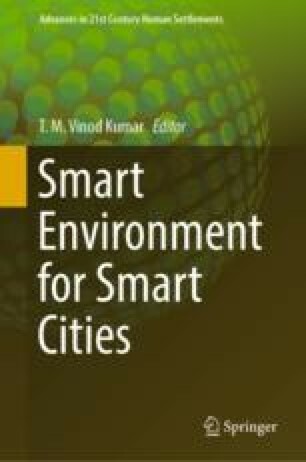 The concept of smart water is derived from the concept of smart cities having one to one relationship in their building blocks. Smart Water Management is a very high responsive, intelligent digital system operated by IOTs and ICTs, clouds, related computer-based models along with humans to identify water-related issues and even automatically using artificial intelligence solving it in real time without human interventions. The chapter presents an attempt to develop a Smart Water Management for Kozhikode Metropolitan area. Water in the study area is studied in conjunction with the spatial distribution of community in a watershed. The issues arising out of the present and potential usage pattern for households for community wellbeing and economic development is the basis of water resources management in Kozhikode Metropolitan Area (KMA). KMA enjoys substantial precipitation a year and is bound by two major rivers on both sides and are lined by many streams within its jurisdiction. However, KMA faces many water-related problems. A SWOT analysis was performed to identify and consolidate the capabilities of various watersheds and its communities in the study area. The issues faced by various communities were grouped into few categories and solutions were proposed for each community. Integrated Smart Water Management is proposed as a solution to the problems faced by the communities. It is footed on the principles of Water democracy, which is implemented through a system of ICT, IoT and decision support systems. The Integrated Smart Water Management System enables the community to be aware of the issues well in advance and find and implement solutions proactively. A spatial decision support system (SDSS) is proposed to help the community to take decisions related to water management. The SDSS takes many of the decisions as per the set procedure and alerts the community only cases where a systematic solution is not available. The integrated water management system implements the decisions taken by the SDSS, through its automatic sensors and actuators managing the water resources. The work explained in this chapter is based on one semester work of the second semester students of M.Plan programme at The Department of Architecture and Planning of NIT Calicut during 2016–17. The authors would like to gratefully acknowledge the efforts of our students Ms. Anagha K. J., Mr. Arjun P., Ms. Bigly Sathyapal, Ms. Fathima Zehba M. P., Ms. Gopika C. B., Mr. Jose B. Thomas, Ms. Kesowe-U Wetsah, Mr. Kuruva Manoj Kumar, Mr. Lekkala Venkatakrishna Reddy, Ms. Mekhana S. S., Mr. R. S. Vishnu, and Ms. Salimah Hasnah. We also acknowledge the support extended by all our colleagues in the department for this work.